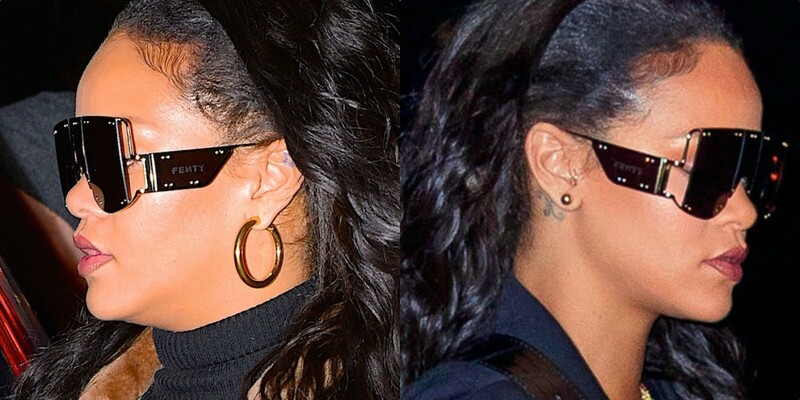 Yesterday, eagle-eyed Rihanna fan account Haus of Rihanna spotted a paparazzi photo of the singer wearing an oversized pair of brown studded, rectangular sunglasses and posted a zoomed-in shot on Twitter, showing the word “FENTY” written on the side. “New collab or just customization?” they asked. It wouldn’t be the first time Rihanna secretly introduced the world to a new Fenty product. She’s been known to sport Fenty Beauty products on the red carpet and on Instagram months before their release. If you search the Fenty by Rihanna trademark, you’ll see everything from eyeglasses to phone accessories to nail clippers, jewelry boxes, and more. There have even been rumors swirling of Rihanna developing collections of wine, liquor, furniture, and skin care. And while the glasses Rihanna‘s wearing are obviously gorgeous, they’re not the only reason the Fenty trademark is in the news lately. Earlier this week, it was announced that Rihanna is suing her father, Ronald, over his talent development company name: Fenty Entertainment. Rihanna allegedly believes her father is using the Fenty name to benefit from the success of her makeup line and is misrepresenting himself, as Rihanna has no association with the entertainment company whatsoever. Apparently this also includes Ronald signing a deal for “a $15 million exclusive concert deal on her behalf without her authorization.” Yikes. We’ll keep you posted on the development of the Fenty Glasses line. Until then, we’ll be here in our Savage x Fenty lingerie, wearing Fenty x Puma slides and Fenty Beauty makeup products, living our full-fledged Fenty lives…listening to a three-year-old album on repeat Rihpeat.